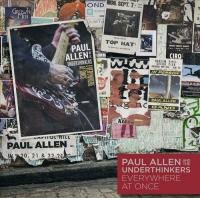 Omit your preconceived opinions of Paul Allen the philanthropist, and introduce yourself to Paul Allen, the songwriter and musician, and his powerhouse band, the Underthinkers. They're pretty good at this music stuff. 1. Does the material, performance, and production stand on its own? 2. Is the finished product worthy of major-label attention? The answer to both are a resounding yes, thanks to the assistance from a bevy of rock's ambassadors, and one hell of a production team in Doyle Bramhall II and Justin Stanley. This is a quality release of blues-rock that's enjoyable from start to finish, and the songwriting from Allen and his collaborators are paired well with their guest performers. "Healing Hands", "Pictures of a Dream", "Divine", and "Straw Into Gold" are just some of the highlights. The album as a whole is just a big, wonderful surprise. Start to finish.